Recessions, anaemic investment and rising unemployment are generally viewed as momentary ailments reversible through macroeconomic policy interventions. These policy options are usually considered within the Keynesian-monetarist or free markets-government frameworks. 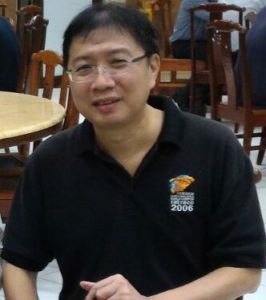 But since the global financial crisis of 2007, it has been noticeable that the traditional policy remedies are losing efficacy. The loss of effectiveness is probably because the traditional paradigms are irrelevant due to the landscape disruption by information effects. The continued use of traditional policies mattered less in the past because many economies were able to enjoy the best of both worlds – the protective strengths of traditional industrial institutions such as the middle class, trade unionism and the welfare state combined with the convenience and efficiencies of the new technologies. Policy-makers thus continued to rely on traditional policies in the main while maintaining flexibility through expediently relying on markets to bear the brunt of adjustments in a fast-changing landscape. But the corrosion of industrial society structures may have reached a point where the harsher aspects of information are pervasive and can no longer be ignored. It is not a matter of addressing economic stagnation in an industrial environment context but a wholesale reconsideration of policy objectives and strategies for a transformed landscape; namely an information society. Information conjures a mirage of abundance, efficiency and convenience but the virtual displacement of physical activities dampens income generation, aggravates inequalities, unravels social cohesion and undermines community support and financial stability. In this context, traditional paradigms are irrelevant in a matured landscape with aging populations, small-sized families, transient jobs, polarised societies and where virtual markets are substantially larger than physical economies. The concept of an information society itself is a suggestion that there are new and better ways to organise resources, corporations, capital and governments. In relation to this, there is an urgent need to upgrade the macroeconomic frameworks to address the yawning gap between theory and reality. There is probably no better place to start than by observing how economic systems are really working in practice and to build models that reflect the changed landscape. In line with this, I have proposed the paradigm of an anorexic and financialised economy. The anorexic economy is a term I coined for an economy that suffers aggregate demand shortfalls despite the presence of efficient and profitable corporations. It is a significant concept because the anorexic economy behaves differently from the textbook economy. Textbook models assume fiscal stimulus generate additional rounds of consumption through multiplier effects. The increased demand leads to rising employment and wages. This forms a virtuous cycle where increased consumption feeds into fiscal revenues to finance higher government expenditures. But this virtuous cycle doesn’t apply to the anorexic economy. Instead, the anorexic economy is characterised by the structural dominance of corporate profits relative to wages in national income. The rising share of profits reflects economic growth is driven by expanding profit margins. This is achieved by reducing the share of physical resource costs (such as raw materials, capex and labour) and increasing contributions from financial transactions (trading, financial restructuring and reducing tax payments). In the anorexic economy, fiscal stimulus expands corporate profits rather than consumption. This explain why stockmarkets react positively to fiscal stimulus but economic and wage growth remains anaemic. The high profit-share-of-GNP thus decouples the traditional relationships between GNP, labour and capital. This implies tax cuts may not have a significant impact on wages or investments and that the impact of fiscal policy through asset prices has grown in importance. Perhaps it is time to change the macroeconomic circuitry that is usually used to analyse fiscal policies; particularly in assessing outcomes in relation to growth, stability and distribution issues. What is also becoming apparent are that corporate behaviour is emerging as a significant factor and that governments need to seek to align corporate goals with policy objectives. In the absence of a revival in private investment and spending, governments will be unable to stage a fiscal exit. The anorexic economy is also typically a financialised economy. Traditional monetary theory tends to analyse central bank interventions as operating through the money multiplier and credit channels. 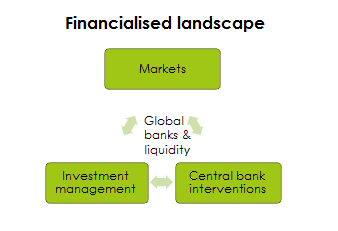 However, the current financial landscape comprises financial markets, investment funds and the central banks. The global banks rather than markets operate at the centre as the aggregators and integrators of risks by providing liquidity and connectivity. The major central banks have evolved into their current role as market-makers and ultimate underwriters of risks. 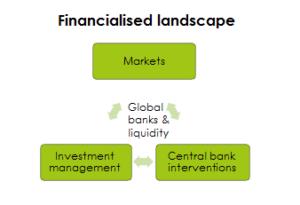 In this landscape, monetary policy conduct should be considered in relation to the role of the global banks in market-related financing and trading. The willingness of central banks to hold large amounts of private and foreign assets distorts the money multiplier and strengthens the linkages between monetary policies and leverage, portfolio allocations, market liquidity and asset returns. Large-scale financial trading causes the traditional relationships between interest rates, bank lending, business activities and output to break down and disconnects monetary policy from economic activities. As a result, the financialised economy is generally characterised by an over-sized financial sector, excessive debt creation, asset price bubbles and hyper-active trading. The irony is that the large financial sector is seemingly inept at intermediating excess savings into financing economic growth and is reliant on central banks to support market liquidity. Having accumulated massive intervention assets, central banks must now ponder the uncertain and unintended consequences of unwinding their bloated balance sheets. 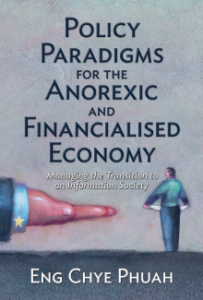 There are some common and interlocking themes in the anorexic and financialised economy. Corporations grow their profits by containing labour costs and payments to the government. When corporations choose to save rather than invest, the economy will turn anorexic and become dependent on fiscal stimulus to sustain aggregate demand. The higher private sector savings combined with higher profits underpin asset price increases which lead to excessive debt and liquidity creation. The higher rates of return further compound capital accumulation which is invested in government debt which, in turn, is used to finance fiscal spending. Under this paradigm, when capital accumulates at a faster pace than economic growth, corporate profits grow at the expense of jobs and wages while keeping asset prices relatively buoyant. Overall, as information capabilities and volumes improve, the information effects will be accentuated. There will be little protection from the consequences of an economy that is using less physical resources, labour and capital. If governments respond to social backlash by reducing (controlling) the flow of information and choice, this will reduce the levels of monetisation and exchange and consequently reduce the levels of trade, liquidity, output, income, social value and cooperation. The absence of an overarching paradigm for the information society and realistic macroeconomic frameworks means policy-makers lack reliable tools to manage the stress points emerging in the information society. The options are either to come out with new paradigms or just tinker with the old ones that take full cognisance of the information effects. In this regard, relinquishing physical paradigms could provide unanticipated benefits from redefining problems and resetting objectives. New paradigms afford us the opportunity to build what we want and to re-organise institutions and processes to achieve the vision based on more advanced information capabilities. In my next few articles, I will explore the different phases of the transition to an information society; starting with the transition from manufacturing to services and then to sharing.